Having been educated and lived in both China and UK, Dr Yan has an extensive knowledge and understanding of the culture and history in both the East and the West. 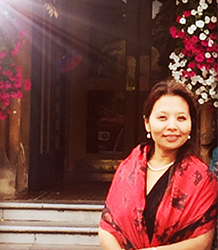 She joined University of Exeter in 2009 and she has been involved in teaching, examination and marking for Chinese modules at different levels including Beginners, Intermediate and Advanced. She has also been involved in designing and teaching new modules in Business Chinese, which have been positively received by students. Furthermore, Dr Yan has been regularly involved in delivering preparatory intensive courses in Chinese culture and Chinese language for students who take summer courses in China and also TESOL programmes. Dr Yan's PhD research is a pioneering longitudinal study of Chinese women entrepreneurs that focuses specifically on the government economic reform period of 1980 to the present. The study makes a significant contribution to entrepreneurship studies and it contributes to our knowledge of women entrepreneurship in transitional economies. The research investigates the drivers that influence and factors associated with Chinese women's entreneurial success in China. The research also explores the motivations of Chinese women entrepreneurs in starting-up their business in the reform period across the last three decades. A number of Chinese women entrepreneurs in three groups who set up their own business in the 1980s, 1990s and 2000s were investigated for an in-depth interview, using narrative approaches in a qualitative reseach methodology. How Chinese culture , government policy and massive domestic market demand have influenced Chinese women's identity. The barriers, family issues and effects of relationships were uncovered during the research.